Welcome readers to Week 17 of the MFRW Blog hop. 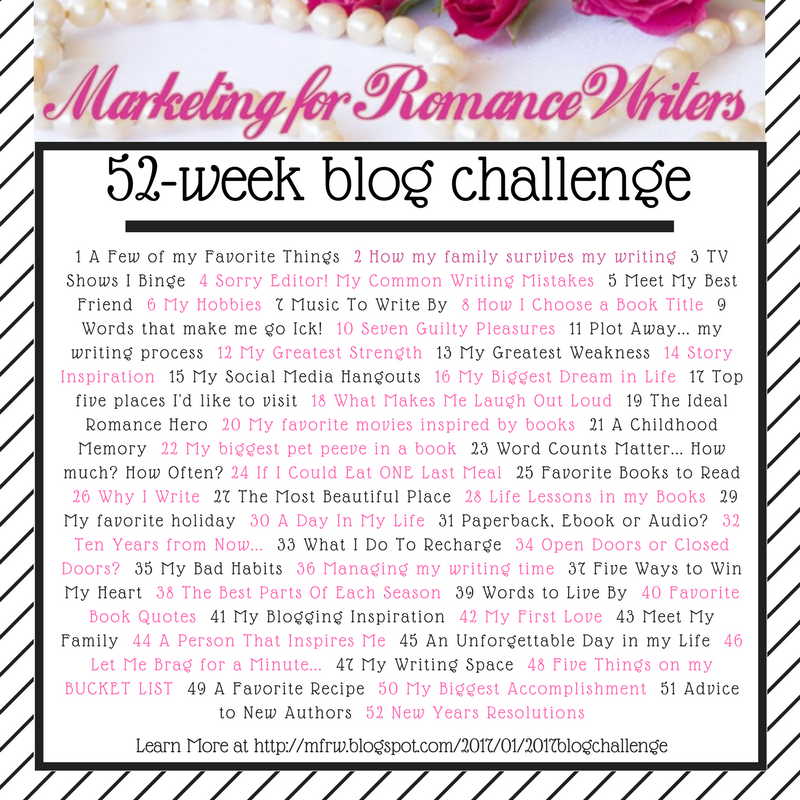 This weeks prompt is: Favorite Romance Genre to Read or Write. I started five times to do last week’s prompt and walked away with it unposted. Last Friday was my anniversary date for diagnosis and I was an emotional wreck. Sorry guys, I tried but just couldn’t seem to string together cohesive thoughts. My Favorite Romance Genre to Read or Write is a satisfying romance with a happy ending. What do you mean that isn’t a genre? Yes, it is. I have read everything from Steeple Hill Christian romance to Triple X erotica and everything in between. I have read Historical Romance and some I greatly enjoy like Lynn Kurland – I love her world and how her characters all link together. Ms. Kurland’s books often involve time travel to a previous century. She also has some about ghosts. Outlander is an Historical Romance as well as time travel. If you have not read Diana Gabaldon’s Outlander series – from start to finish at least once, then how can you call yourself a romance fan??? I know that most everyone expects Nora Roberts to be at the top of a romance fan’s list, but I have to be honest. Meh! I like some of her older stuff. The Reef had me turning pages! Key of Knowledge, Key of Valor – I liked those. Rising Tides and that series was awesome. The series – sorry I can’t remember the titles – about the Irish brothers and sister, those were phenomenal. But, in my humble opinion, her stories just got too formulaic for me. No, I have not read her work as JD Robb. I can’t talk about romance without my favorites – Katie McAlister always has number one position. It doesn’t matter which book, I love her sense of humor whether it’s a contemporary or paranormal. Trust me, I’ve read them all. One day I will have an autographed book from her. My second favorite is Karen Marie Moning’s Highlander series. Love those Scots! Then, of course, we get into The Black Dagger Brotherhood, Christine Feehan and of course we can’t leave off Charlaine Harris. I mean after all, who doesn’t love a southern vamp? I’ve read many Indy authors as well as mainstream. I am a diehard Jane Austen fan since high school. Sherrilyn Kenyon, Catherine Coulter, Karen Docter, and Gena Showalter’s Darkest series all have high marks from me. I prefer traditional male-female romances. I tend to reread authors I liked, hence the list above. Many times I’ve perused the shelves and had three or four in my hand, then selected two out of those for purchase – one from an author I’ve read before and a new author. I couldn’t even begin to tell you how many Harlequin romances I read. Some were good some were meh and some were really bad. To me, the most satisfying romance story is one that meets the happily ever after ending. Ironically, Katie McAlister’s Aisling Grey series aren’t HEA, but I adore them. I have to mention here another favorite, Louise Rennison. When my daughters were in their early teens, we picked up the first of her books – Angus Thongs and Full-frontal Snogging. I About Died from laughing so hard! Ms. Rennison’s books are teen romances, full of angst, melodrama, and hilarious hijinks. If you haven’t read them – DO IT! Everyone needs a good laugh! The only other book that I laughed as hard was Katie McAlister’s Corset Diaries. As to writing, so far I’ve written contemporary romance but this next one that I am working on, which is actually written and now in revisions, is a paranormal romance. I don’t think I could write a historical romance, you have to be such a stickler for details. I greatly enjoy reading them, but I don’t get all hung up on whether they have twenty-six buttons down the back or a tie string on their pantaloons, and oh wait, they didn’t wear pantaloons beneath their dressed at that time. I’m more interested in the interactions between the hero and heroine, and what happens between them whether it ends with a first kiss or full disclosure details that you feel like you need a smoke afterward; and I don’t smoke! All of my books have an element of romance, although romance isn’t the main focus of this next one. The basic desire in each of us for companionship, passion, desires, and to have someone who loves us unconditionally, I believe is a very real driver for the vast majority of us. Fans of romance get that when they read our books. We can experience vicariously the rollercoaster ride of falling in love, heartbreak, restoration, danger, mayhem, terror, and satisfaction without leaving the safety of our living room. Isn’t that the root of all successful books? What subgenres in romance do you like to read? Well, if you haven’t read mine yet, here’s a little bargain for you to try them! You can go to the blog hop and check out what other authors have to say about this by clicking on MFRW BLOG HOP.